On our Normandy and Brittany trip you will tour two distinct regions of France that boast larger-than-life personalities, legacies of conquests and conquerors and stunning land and seascapes. In Brittany, discover megalithic sites and Celtic origins, as well as a culture influenced by the sea. In Normandy, explore Mont Saint Michel, Norman and Gothic architecture, and landscapes captured by the Impressionists, as well as Normandy's connections to the liberation of Europe in World War II. double occupancy - 8 seats ONLY for thIS superb tRIP. After a day or two visiting the SIMA in Paris, your tour director will pick you up at your hotel in the morning to head west. You will have lunch after walking the cobbled streets of the charming port of Honfleur. A stroll in the meandering lanes will allow you to admire medieval and traditional Normand houses, the 15th-century Sainte-Catherine church, with a bell tower separated from the principal building is the largest church made of wood in France; the Saint Etienne church built in the 14th-century, the two remaining “Grenier a Sel” (salt barns) which were used to store 10 metric tons each of the precious preservative for the fishing industry. This picturesque old port, characterized by its slate-covered frontage houses, is where artists including Courbet, Boudin, Claude Monet, and Jongkind, were inspired to paint. These artists founded École de Honfleur which contributed to the birth of the Impressionist movement. Samuel de Champlain left his home town to found Quebec city. 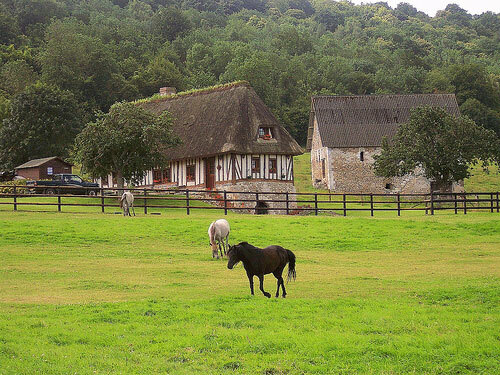 Still driving west toward Bayeux, we will stop by a distillery for a tasting of the local beverages, hard cider, and the famous Calvados, you will be able to buy some bottles directly. If time permit we could stop by a cheese farm to discover the “three kings” of Normandy: Camembert, Pont L’eveque and Livarot cheese. Convivial group dinner and night in Bayeux. After breakfast, we will spend time at the city museum for the Queen Mathilde Tapestry, the first historical “comic strip” (dated 1077). 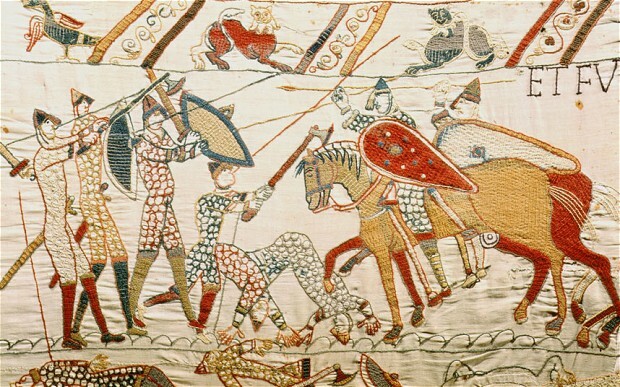 The tapestry is more than 200 feet long and describes the invasion of England by the Normand of Guillaume le Conquerant in great details. Hint: an easy way to figure out who is who is to look at the men; the Englishmen wear a mustache while the Normand have their face and neck shaved. Mid morning drive to the Mont Saint Michel. Aubert, bishop of Avranches built the first church on the island, consecrated October 16 of the year 709. Then in 966 to the request of the Duke of Normandy a Benedictine community was established building the pre-romanesque church before the year 1000. Lunch on the island before an afternoon visit guided by a historian. Group Dinner and night in Saint Malo. A full day to leisurely visit three very different and charming towns. The walled city of Saint-Malo at the mouth of the Rance River was a fortified island in the medieval times. Later it became the home of corsairs (privateers) and pirates. The corsairs were forcing English ships passing up the Channel to pay tribute; controlling all trade they brought great wealth to the town. Jacques Cartier, the discoverer of Canada, lived in and sailed from Saint-Malo. Dinard, a XIX century resort and finally Dinan known for its Breton medieval ramparts, cobblestone streets and half-timbered houses. Dinan Castle has a 14th-century keep and the Tour du Coëtquen, a 15th-century artillery tower. Group dinner and second night in Saint Malo. We will be in Saint Brieuc train station to catch a 3:30pm TGV train direct to CDG airport where you will spend the night (cost included) allowing a stress free morning departure. Arrival home same day in the afternoon.